Cut brownies into 1″ squares. Prepare pudding with milk. When thick, fold in cool whip. 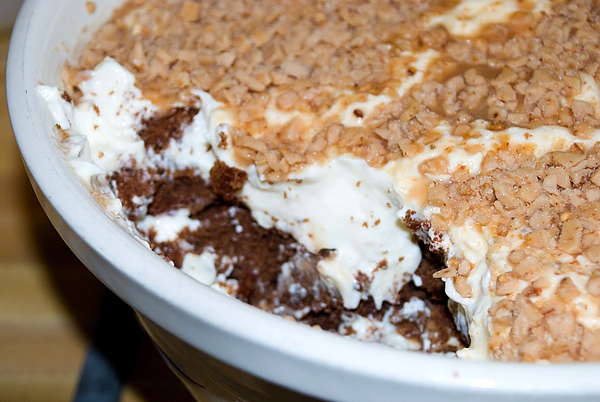 Layer ½ brownies, then pudding, then sprinkle on toffee bits..covering well..in a trifle dish or bowl. Layer again ending with toffee bits. Refrigerate. This sounds WONDERFUL!!! We celebrate birthdays for each month and it’s my “teams” turn to bring desserts this month. I can’t wait to try it out on my teachers! Thank you! I was just doing an internet search for this exact recipe!! !